This story first appeared in The Daily Yonder and is publisher here via KY Forward. It is written by Amy Hogg. The town of about 2,000 in Southeastern Kentucky lacked a “community convivial space” such as a bar or pub where cross-pollination of ideas and culture could occur. Buildings in downtown Whitesburg were cheap and easy to come by because so many were vacant. Beverly bought an old store front, most recently housing a karate studio, to use the floor above as office space for his environmental consulting business. As they peeled back layers of dropped ceiling, paneling and carpet, “it just suddenly started to reveal itself as this really lovely space,” Kirby said. The wheels started to turn. “We sort of started thinking about ‘What kind of things could this space be?’ and that led to ‘What do we wish we had in this town that we always leave for?’” Kirby said. Aside from a community convivial space, they wanted really good food. Talk of legalizing alcohol sales was floating around Whitesburg at the time, and they designed a space and built the business plan with hope that Summit City could serve both food and cocktails. The town did go wet, and Summit City became a new example of what was possible for downtown Whitesburg. And at a time when the coal industry was declining and the rhetoric was heating up, dividing the community, Kirby and Beverly thought a lot about what Summit City’s relationship to the coal dialogue would be. “It was really important to have a space that didn’t have parameters defined by us,” Kirby said. Their clientele, as it turned out, was all over the political spectrum. Summit City’s first success was keeping the doors open. Then came the music. With Appalshop’s eclectic radio station, WMMT, in town, Summit City was able to build on a foundation of listeners who were looking for something outside the mainstream. “Our music program has been one of the defining things about Summit City that really sets us apart,” Kirby said. Before the lounge got a liquor license, Summit hosted a concert by Jason Isbell (formerly of the Drive-By Truckers) to a stone-cold-sober packed house that was “silent raptness,” Kirby said. Word got around among national and regional artists that Summit City was a cool venue to play. And it attracts a mix of local amateurs and passing professionals. “There’s some sort of element of trying to convey warmth and welcome, that’s been kind of a core value,” she said. A brush with Alcoholic Beverage Control in 2011, when someone filed a complaint about the percentage of alcohol sales versus food sales, led to Summit City announcing it would close its doors. An unexpected groundswell of support, largely from people Kirby didn’t even know, showed just how much the community valued the establishment. “We announced our closing, and immediately this huge robust resistance movement emerged,” Kirby said. With the city’s support, Summit City was given a second chance by the ABC and was able to stay open with the understanding that the city would ask for a change in the regulation. 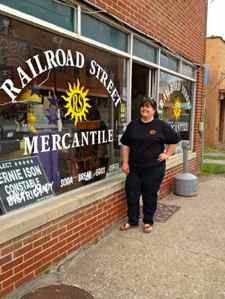 Just around the corner from Summit City is the Railroad Street Mercantile, inspired at least partially by Summit City. “To me, they are a shining example of, ‘Hey, I am going to do this. Maybe I’m not going to make a fortune at it, but I’m going to do this. This is something we need,’” said David Fisher, who opened the mercantile with his wife, Kae, in October 2013. The Fishers, lifelong residents of Letcher County, opened the store because they wanted folks in Whitesburg to have another option besides Walmart and the local grocery chain store. For most of his career, Fisher was “dyed-in-the-wool union.” He worked out of a Steelworkers local in West Virginia doing heavy highway construction until he began to feel that the corporate emphasis had shifted from the workers to the bottom line. He left the Steelworkers to work in the oil fields for a while and saw the difference between the upper class and the middle class – in both income and core values. He also became concerned that large corporations, especially Big Ag, were controlling politics and making it harder for ordinary people to have a voice. “Once I really did see the disconnect, that’s what really got me interested in doing something about it,” Fisher said. He decided to take his experience and knowledge of farming and do something. As a kid, he’d spent summers working in his grandparents’ garden. When other kids were swimming or riding bikes, he was working. Fisher started farming for himself and his family. Through a program called Grow Appalachia, which provides materials for families who want to grow their own food, he had access to a tiller and fertilizer. Before long, he was working part-time for Grow Appalachia, running the tiller and taking fertilizer to other farmers trying to get started. And he began talking with others who were interested in starting a farmers’ market. “Once I got involved in the farmers’ market, I had access to four acres of ground that I tended,” Fisher said. At the time, Kae Fisher worked at Summit City, and she’d often hear people ask where they could buy a bag of chips or bottle of aspirin. It was Kae’s vision that led the couple to open the Railroad Street Mercantile, which sells various necessities, as well as local produce, eggs and meat, and local art. With hard work, help from others and scavenging for materials, the Fishers were able to open the store without going into debt. They think of it as a go-between: not a replacement for the chain stores but a place to buy a few things between trips to the bigger stores. Summit City Lounge, the Railroad Street Mercantile and a handful of other businesses in Whitesburg have worked cooperatively to provide for community needs, breathe new life into a dying downtown, and inspire other entrepreneurs. “Thank you, my friend,” says David Fisher to a customer who comes into the store to buy an ice cream. It’s not just an expression. He knows everyone who comes through the door. He even has a chair sitting beside the door so folks can stay and visit. Kirby and Beverly were motivated to provide the community a space. The Fishers were motivated to be a local store selling local food. Both couples understand that a large part of their contribution is providing an example of what can be done.